Greece has some 6,000 islands and islets dotted around the Aegean and Ionian Seas, although only 227 are inhabited and just 78 of those have over 100 inhabitants. 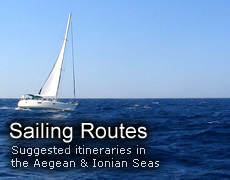 Corfu, Crete, Greece Travel Guides, Greek Ferries, Greek Islands, Map of Greece, Sailing The Greek Islands. Corfu is at its best in May. Covered in flowers the temperatures are ideal, the island is uncrowded and cheap to get to. If you only come to Corfu once try to make it during late Spring. Reviews of accommodation, restaurants, excursions and places to visit - provided by visitors to Corfu. A complete guide to the beautiful village of Pelekas, on the west coast of Corfu. A free minibus service operates throughout the day from three points in the village to both Kontogialos and Glyfada beaches. When Greek island hopping, don't do more than four islands in ten days or you'll waste too much time checking in and out, waiting for transfers and getting oriented. The largest of the Ionian islands, Cephalonia is an island of contrasts where Roman and Byzantine ruins provide a pleasant tour away from the beaches. Chios is one of the North-eastern Aegean Islands, between the islands of Samos and Lesvos. The fifth largest island in Greece is only a few miles off the coast of Turkey. Historical attractions on the uninhabited island, near Mykonos. Evia is the second largest island in Greece and quite undiscovered by tourists. Northern Evia is known for its green forests, rivers, spa and ravines and also for its wonderful beaches with crystal-clear waters. The capital of the island is Halkida. Located between the two villages of Pefki and Artemisio, in northern Evia, the Ilios Suites offers a restaurant, bar, large-sized swimming pool, gym and even a playground for the children. Ferries from Patra and Kefalonia dock at the island's capital, Vathi. Picturesque and beautiful Greek harbour village on the Northern tip of Kefalonia, largest of the seven Ionian islands. Reviews of accommodation, restaurants, excursions and places to visit provided by visitors to the island. Kefalonia is believed to have taken its name from the hero Cephalus. Perhaps the name of the inhabitants, Cephaloi, comes from the word 'cephales' which may refer to Kefalonia's mountains, or to the fact that it is the biggest of the Ionian islands. From its enchanting shores to its breathtaking natural mountains Kefalonia has a wild beauty which you will not find elsewhere; an island of surprises just waiting to be explored. Jules lives on Kefalonia and can be found all over the island updating resort information and adding new resources to his resort finder. Day trip excursions to Turkey and Rhodes mean you can do much more than sit on the beach all day. Just how genuine the reviews are, is open to the imagination as some of the entries are not very literate and could have been posted by anyone. Of course, the point is that anyone can post their recommendations on Kos but some editorial control would probably make these sites more worthwhile to the visitor seeking serious information on the island. Probably the best known of the Cyclade Islands, Mykonos is trying to regain its respectable name after years of drug parties and gay visitors to its beaches. Directory of information relating to Mykonos. Includes an interesting sights and sounds section and a brief summary of the island's top attractions. Offers great beaches, lively towns and ancient sites. The island of sun-worshippers is a mammoth 18 hours by ferry from Athens. You can fly in 45 minutes, but we prefer the adventure by sea. Rhodes (Rhodos or Rodos in Greek), the beautiful island of roses, has a unique physical scenery that does not cease to impress its visitors. Also unique is its climate with more sunny days than any other place in Europe. With practically zero crime rate and friendly and hospitable people you'll be surprised how easy life in Rhodes can be. Santorini is the southernmost island of Cyclades and is located between Ios and Anafi; 128 nautical miles from the port of Piraeus and 63 nautical miles from Crete. Geographically Skopelos is an Aegean island situated in the central-north-west Aegean, east of Pelion and north of Evia. Let Giannis Hatzitrakosas tell you more about the beaches, sights, how to get there and around and where to stay. If you've never been to Greece before then Zante is a good choice. Although not as typically Greek or as scenic as some of the other islands, Zante offers better than average standards of food, service and accommodation. Many people come here year after year, and the main reason they give is the friendliness of the local people. A-Z guide to restaurants, bars, hotels and apartments on Zante. Recommendations come from visitors to the island. Check out what they thought or tell others about the places that made all the difference to your holiday. Don't be afraid to travel on a flight-only basis. If you avoid the peak season you will have no problem finding accommodation. Expect long delays at the airport. There isn't much in the way of seating or refreshments. If you visit the shipwreck, wear sandals - the beach is actually sharp stones (often baking hot). Avoid Laganas if you want a quiet night's sleep. Visit Vassilikos to see the true 'Flower of the Levante'. Interactive guide to Zakynthos; the sixth of the Ionian islands, west of the Coast of Ilias. There are over 500 ports in Greece offering more than 5,000 monthly boat and ferry departures around the Greek Islands. Founded in 1967, Anek now has 11 vessels. Domestic sailings between Piraeus and Crete (Chania, Heraklio and Rethimno) and international sailings from Ancona and Venice to Patras, Igoumenitsa and Corfu. Serving west Crete, Kithira and South Peloponnisos since 1999. Connects (Antikythira, Gytheion, Kissamos, Kythira, Piraeus) and (Kalamata with Kissamos and Kythira). (Rafina, Andros, Tinos, Mykonos, Paros). Connecting Lassithi Prefecture (Agios Nikolaos, Sitia) with Pireaus, Rhodes, Kasos and Karpathos island. Daily connections from Brindisi to Igoumenitsa and Patras. Sails to Heraklion (Crete) from Piraeus. From Ancona and Bari to Patras, Igoumenitsa and Corfu. Daily sailings from Bari to Corfu and Igoumenitsa. Also sails from Bari to Durres (Albania). Search the Open Seas database for Greek ferry schedules and tickets. When thinking about sailing around the Greek Islands, try to avoid the high season swarm. Sailing and motor yachts available for charter (with or without crew) in Corfu, Kalamaki, Kos, Lavrion, Lefkas, Rhodes and Skiathos. Includes information, photos, layouts of yachts, specifications, maps, weather and sailing tips. Go island hopping in Greece - full-text searchable Greek island database and an intelligent yacht chosen to help pick the right yacht for you and your budget. Greek Islands - Greek Island Maps.